Tanja Koponen’s (born 1968) artwork in the Project room expands to become a three-dimensional still-life. It consists of objects, video, sound and light. The conversion of a two-dimensional abstract picture into concrete elements, objects in a space, alters the experience of viewing. The viewer is at the same time an observer on the outside and within the piece. The black and white nature of the work underscores a difference from the reality from which the viewer steps into the picture. 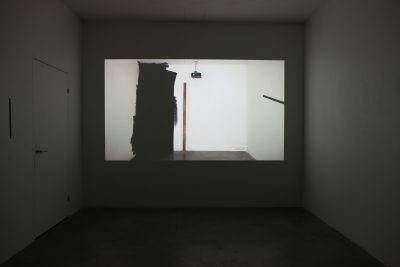 The video image that is part of the work adds further complexity to the viewer’s role and questions the connection between two worlds – those of the image and the viewer. This work explores the boundaries of these two realities. In This Room is not only an installation but also an event that Koponen constructs with the aid of light and sound. Tanja Koponen’s recent solo exhibitions have been Air at Galleria Huuto (Jätkäsaari, Helsinki, 2013), In This Room at the project venue of the Finnish Museum of Photography and The Inside is the Outside at Galleria Sinne (2012).